The original USS Enterprise returns in the second season of Star Trek: Discovery, complete with updated uniforms and re-imagined versions of those classic Starfleet insignia! 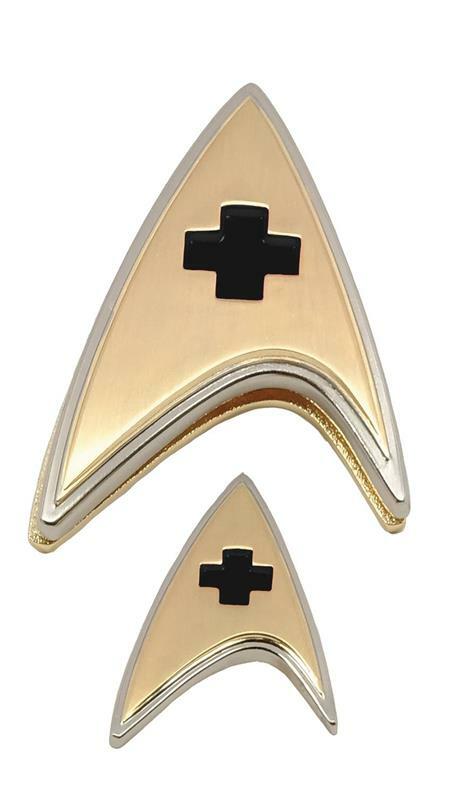 QMx brings you exact replicas of the screen-used Enterprise badges. Plus for the first time ever, included with each badge is a miniature lapel pin version of the same design! The new metal badges are shiny gold with a brushed silver outline and a debossed division icon, and as with all of the QMx badges, these exact replicas are taken directly from the screen-used hero prop! What sets these wearable badges apart from the original is the clasp, which uses strong, short-field magnets that are embedded in each badge and in a metal backplate. No more pinholes in delicate fabric. They can even be worn on leather and suede.